This was a squash, but it was fun. Ford and Dawkins brought a lot of personality as usual, and I very much enjoyed it. After the match, the Forgotten Sons attack the Street Profits. They use the element of surprise and the one man advantage to stand tall as the Street Profits struggle to get up. 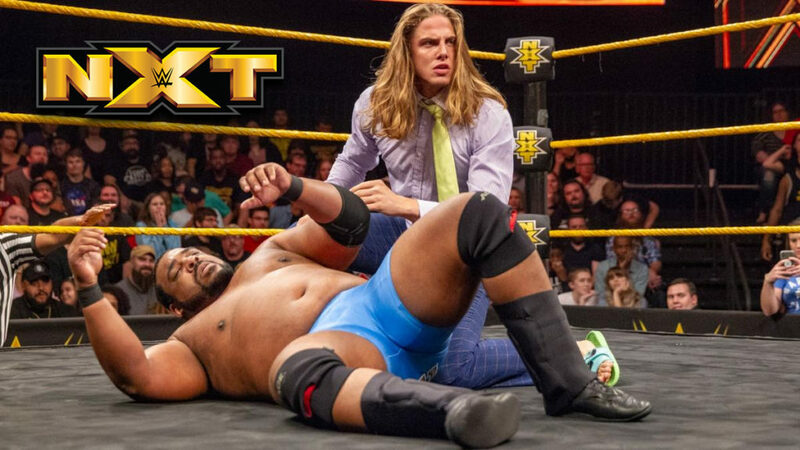 Cathy Kelley asks Matt Riddle if he will be ringside to see Keith Lee fight Kassius Ohno. Unfortunately, Riddle hasn’t been cleared, so he can’t be in Lee’s corner. Riddle just hopes Lee leaves some of Ohno for him. Keith Lee looks ready to fight. Aleister Black says that Johnny Gargano is going to get his reckoning, and they might as wellstart the fight next week. Bianca Belair heads to the ring. She says that 2019 is her year. The year just started, but she has 20/20 vision when it comes to the NXT Women Title. At Takeover: Phoenix, the EST of NXT is taking the title. Why? Because she’s un-de… Shayna Baszler heads to the ring with Marina Shafir and Jessamyn Duke. After a few seconds, Belair slaps Baszler. Duke and Shafir attack, but Belair escapes and quickly exits the ring. Belair walks away as Baszler looks on. Good match. I really liked what Jaoude did in this match. He frustrated Dijakovic early in the match with a lot of mat wrestling, and it was fun to watch. Jauode never hit any big moves, but he kept Dijakovic on the mat and off his game for a good part of the match. Dijakovic, on the other hand, did hit some big moves. He hit almost exclusively big moves. Jauode couldn’t survive the power of Dijakovic very long. The War Raiders say that they respect Undisputed Era. At Takeover though, War Raiders take everything. Tonight, War Raiders celebrate their victories by burning a couple of Undisputed Era steel chairs. A recap of NXT UK Takeover: Blackpool. Good match. Carrillo looked good early in the match. He flew all around the ring and had Gargano on the defensive. Once Gargano gained control though, it was only a matter of time until Carrillo was down on the mat. Gargano was convincing in this victory. Tommaso Ciampa says Aleister Black is gullible. So gullible. Black wants Ciampa to fight next week? Ciampa only fights in big matches. A video promo for Velveteen Dream. Dream is live on NXT next week. Good match. Ohno spent most of the first half of the match hitting Lee really, really hard. Lee absorbed the punishment and dealt some of his own with some agile and powerful offense. This was a good fight between two big guys. There were some shenanigans at the end, but I think it was necessary not only to continue the feud, but also to help keep Ohno as a dangerous and credible part of it. After the match, Matt Riddle runs down to the ring, but Ohno leaves the ring before Riddle gets there. Ohno leaves the ring area while Riddle checks on Keith Lee. Good show. It felt a little like a character building episode, and that’s fine. Carrillo and Jaoude were surprisingly good in their matches, so even the bouts that seemed like they would be squashes were good for everyone involved. This was competitive in ways that the other matches tonight were not. Plus, it had the best (and only) story attached to it tonight.